You may believe wrinkles, lines, and furrows are an inevitable fact of aging, but many North Carolina residents have discovered that Saluja Cosmetic & Laser Center offers a tried and true answer: BOTOX®. The Charlotte, NC, area practice led by Dr. Raminder Saluja offers these quick and effective treatments to help patients who want to look as good as they feel. More than a decade ago, the FDA approved BOTOX® Cosmetic as a safe and effective treatment for unwanted facial lines and wrinkles that develop over time with repeated muscle use. Since then, millions of Americans have embraced the opportunity to turn back the clock without the expense or time commitment required by more invasive procedures. In fact, in the United States alone, more than 6 million women and men received a BOTOX® or related treatment in 2014, making it the fastest growing and most popular minimally invasive cosmetic procedure in the country. 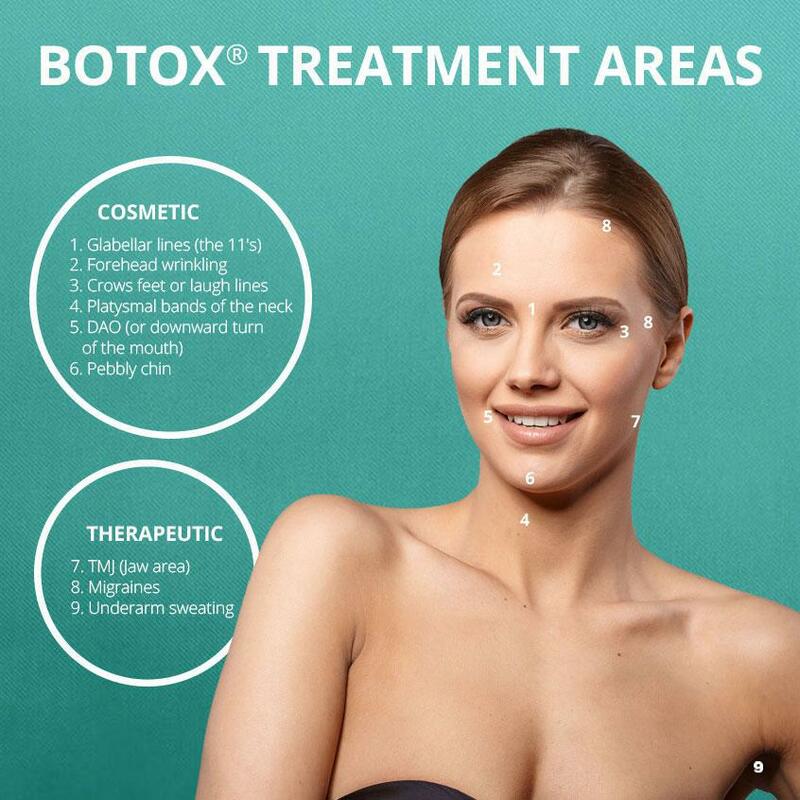 BOTOX® has a long medical history, dating back to the 19th century, when a German medical officer realized that the substance could be utilized therapeutically to block unwanted muscle spasms and behaviors. In the centuries that followed, the neuromodulating protein known as BOTOX® been used by doctors around the world to treat countless patients suffering from eye muscle disorders, excessive sweating, migraines, muscle spasms, and dozens of other disorders and conditions. Despite its lengthy medical history, it is now best known for its cosmetic applications, helping patients look younger in a matter of minutes. Wrinkles are an unfortunate, but inevitable fact of aging. A number of factors contribute to the appearance of lines and wrinkles, among them sun damage, smoking, dehydration, and repetitive muscle contractions. During your consultation, we will share tips, advice, and best practices for preserving and recapturing your skin's youthful elasticity (hint: sunscreen is one of your best allies in the battle against prematurely aging your skin). But even the most conscientious patient cannot completely stop the hands of time. 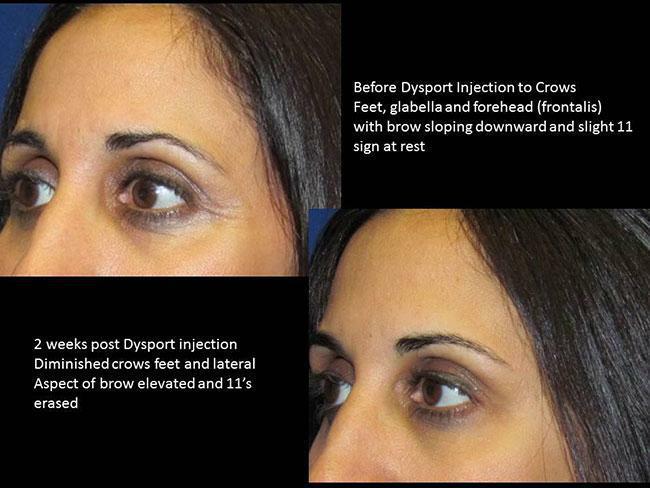 BOTOX® Cosmetic is one of the gentler and quicker methods for achieving a more youthful face. Specifically, this treatment targets glabellar lines, which are the wrinkles that form between the eyebrows, as well as lateral canthal lines, also known as crow's feet. 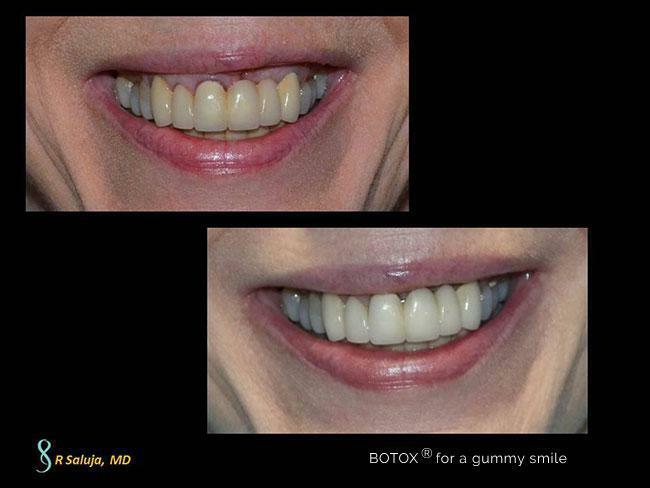 BOTOX® Cosmetic is one of the quickest, gentlest ways to customize cosmetic corrections for issues such as (1) Wrinkles between the eyebrows, (2) Horizontal forehead lines, (3) Crow's feet near the eyes, (4) Platysmal/neck bands, (5) Downturned mouth, and (6) Dimpling/pebbly chin, as well as for therapeutic improvements to (7) TMJ (jaw-skull joint) disorders, (8) Migraines, and (9) Excess underarm sweating. BOTOX® Cosmetic treatments relax the muscles in the targeted section of the face, preventing the muscles from forming new wrinkles. You should begin to notice an improvement within about 72 hours of treatment, though it may take a full week to two weeks for results to fully materialize. The positive effects of your treatment will last anywhere from three to six months, after which many patients choose to schedule another treatment. Studies indicate that patients who regularly receive treatments may have longer-lasting results and require treatments less frequently than patients who have never received a BOTOX® Cosmetic treatment. The beauty of BOTOX® at the Charlotte, NC, area's Saluja Cosmetic & Laser Center, is that patients can schedule treatment immediately following the consultation, and a treatment session generally takes less than half an hour. Following this procedure, patients can immediately resume their normal activities, whether that involves returning to work, socializing with friends, running errands, or even a gentle workout at the gym. In the immediate 24 hours following treatment, patients should refrain from touching or rubbing the treated area and avoid strenuous physical activity, consumption of large amounts of alcohol, and other cosmetic procedures, including facials and chemical peels. We encourage our patients to contact us with any questions or concerns both before and after treatment. BOTOX® Cosmetic is a minimally invasive procedure used by millions of women and men every year with very little risk. However, because it is such a common procedure, a number of nonmedical facilities around North Carolina, and the country, now offer BOTOX® Cosmetic with only a few days of training. Patients interested in BOTOX® Cosmetic are advised to seek an appropriately trained and licensed medical professional to reduce any risk associated with the procedure and ensure the best possible results. Some patients report experiencing a slight pinching sensation at the injection site. Patients who are particularly sensitive or concerned about pain can request a topical anesthetic from the doctor. Potential side effects include brief tenderness and redness at the injection site, headache, and nausea. Patients who are pregnant, nursing, or suffering from certain neuromuscular diseases are not good candidates for treatment. During your consultation, you will be asked to provide a medical history, including medications, allergies, and recent treatments or procedures, and are encouraged to share any concerns with Dr. Saluja prior to treatment. During your consultation, Dr. Saluja will discuss your unique concerns and goals in order to determine whether BOTOX® Cosmetic is, in fact, the appropriate treatment for you. While this treatment may be ideal for Charlotte, Huntersville, and other North Carolina patients looking to target fine lines and wrinkles, an injectable filler such as Juvéderm® might be a better alternative for deeper wrinkles or patients who might benefit from added volume in certain areas of the face. If you're uncertain which treatment might be best for you, Dr. Saluja will work with you to develop a personalized treatment plan. Fees for treatment in Charlotte vary from patient to patient, depending on the number of areas requiring treatment, the severity of the lines and wrinkles being treated, and the specific desires of the patient. During your initial consultation, Dr. Saluja will discuss your unique needs and concerns. Based on this conversation, she will provide a recommendation, including the cost associated with this treatment. The $25 cost of the consultation will go toward your fees. Dr. Saluja is sensitive to a patient's financial concerns and is happy to help patients develop a treatment plan and schedule that meets their needs. For BOTOX® Cosmetic patients seeking financing, we offer six-month financing options through CareCredit for patients whose procedures cost a minimum of $300.